Mobile phones have become one of the primary ways in which people around the globe communicate with each other. Still, adoption and usage of those devices can vary greatly from country to country. 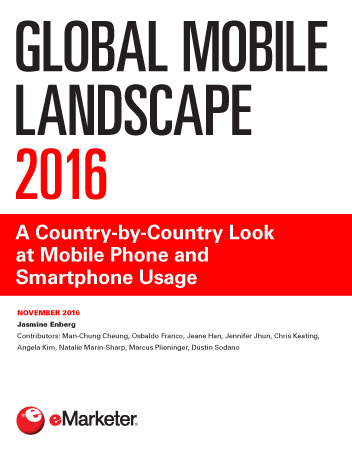 This report examines the use of mobile phones and smartphones in major markets in Asia-Pacific, Europe, Latin America, the Middle East and Africa, and North America. Nearly 60% of the worldwide population will own a mobile phone and use it at least one a month in 2016, eMarketer estimates. Due to already-wide uptake, mobile phone user growth will slow to 2.2% by 2020. While the number of smartphone users worldwide will climb by double digits this year and next, user penetration is reaching saturation in many countries. Emerging smartphone markets will be the key drivers of continued growth, as the cost of owning those devices declines and mobile infrastructures improve. Samsung is the top smartphone manufacturer on a global level, though Apple controls a significant share of the market in wealthy, digitally developed countries. Chinese smartphone brands have also made strong headway, especially in Southeast Asia. 4G LTE access has made notable inroads in most markets worldwide. While North America boasts the highest share of 4G mobile connections overall, some of the most reliable 4G networks are found in Japan, Singapore and South Korea. Japan and South Korea are leading the way in 5G development. Strategy Analytics expects that the first commercial 5G handsets will become available in those two countries in 2020, followed by a handful of other early adopters like the US and China in 2021. By 2025, 7% of worldwide mobile connections will be 5G. "eMarketer estimates that there will 4.30 billion mobile phone users worldwide in 2016, representing 58.7% of the global population. Though user growth is slowing, the number of mobile phone users will climb to 4.78 billion in 2020."